Here’s a great opportunity to raise some funds for St. Richard’s Hospice and get your running shoes on with your teams, friends and relatives! Worcester Full and Half Marathon on Sunday 20th May is an ideal opportunity for the fit and the able amongst us to get together and run around our beautiful city for a wonderful cause. 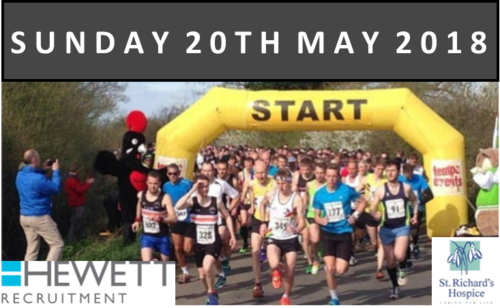 Hewett Recruitment are sponsoring this hugely popular event for the 7th year running. Both distances start at 9.30am in Offerton lane, which is a five minute walk from the Rugby Club. The full marathon takes in two laps of the loop around beautiful rural lanes with a small addition to make up the distance. The half marathon accompanies the full for the first lap before splitting away at mile 11 and leading back to where both races finish in front of the Warriors ground. Everyone who finishes receives a medal and t-shirt and the satisfaction that they have taken part and raised money for a great local charity. It’s a very heart-warming experience but for those feeling a little sore at the end of it – Hewett’s have arranged for ‘Sports Therapy Studio’ to be on hand at the finish line with a team offering well deserved sports massages to sooth those aching muscles. We will also be there at the finish line to cheer you home and hand out your medals and t-shirts – go on join in the fun – we look forward to seeing you there!